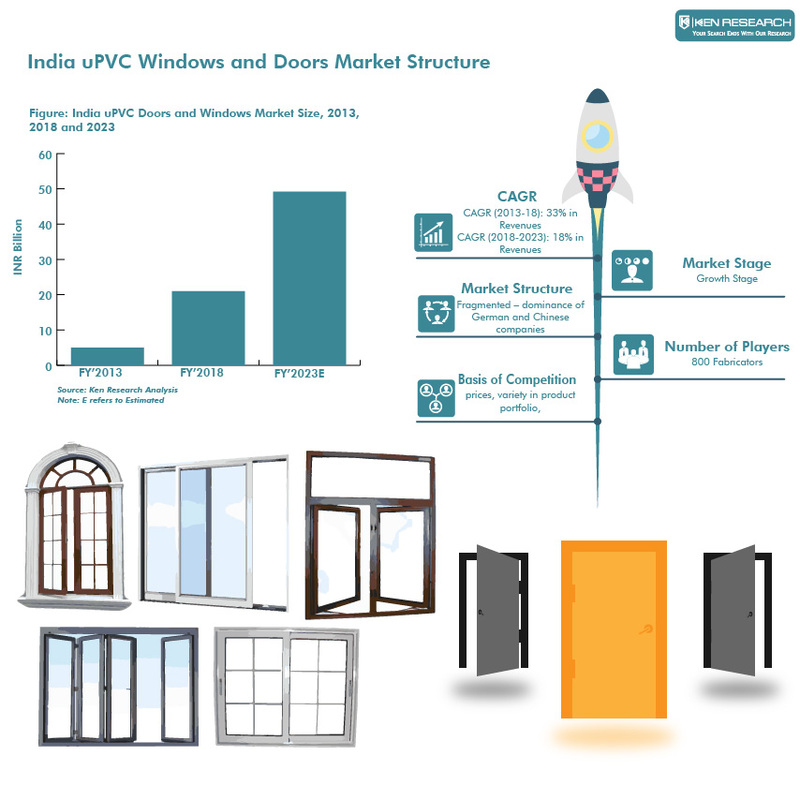 Expansion of product portfolio by major UPVC doors and windows manufacturers, growing awareness, infrastructure development in premium residential, hospitality, and healthcare sector were the key factors driving growth in India UPVC Doors and Windows Market. The report titled “India uPVC Doors and Windows Market Outlook to 2023 – By Fabrication and Extrusion Segment, By Major Cities (Delhi, Bangalore, Mumbai, Chennai, Kolkata), By Raw Material Procurement, and By Application (Residential, Retail, Hotel, Hospital and Institutional)” by Ken Research suggested a growth at a five year CAGR of approximately 19% in terms of revenue in India UPVC Doors and Windows market respectively in the period FY’2019- FY’2023. In India, uPVC is still a new concept and was characterized by low penetration, about 12% in overall doors and windows market in FY’2018. Since the past decade, the Indian fenestration industry has undergone quite a remarkable transformation due to the introduction of several newer window and door technologies. Apart from the traditionally used materials such as wood, steel and aluminium, one such material that is rising in popularity is UPVC (unplasticized polyvinyl chloride). The several tangible and intangible benefits of UPVC makes it a versatile fenestration choice because of its strength, durability, low maintenance, energy efficiency, and sustainable qualities, as well as its resistance to corrosion, dents and scratches. The market is characterized as highly price sensitive but there has been an increasing focus on brand and quality of products. Several small-midsized local fabricators supplied economical uPVC products; however, their quality was far inferior and non-compliant to international standards. Hence, quality and price remains to be the most important concerns that need to be taken into consideration by the builders and consumers. Large organized companies such as Fenesta, NCL Wintech, Window Magic, Encraft, Profine India, VEKA India and others have been focused on delivering high quality UPVC products and spread awareness about the several tangible and intangible benefits of uPVC to compete and sustain in this industry. The market has been growing majorly due to rising awareness amongst builders and consumers, rapid urbanization, growth in residential units and increased adoption of eco-friendly and energy conserving products to comply with government’s initiative of Energy Conservation Building Code. During the review period, major companies in this space took to organic expansion strategies in terms of production capacity expansion and widening their product portfolio to cater to different income brackets. For instance, Fenesta Building Systems increased its production capacity by 400-500 MT and expanded its retail presence in Tier I and Tier II cities. Another leading player, NCL Wintech has developed an economy brand, Plast One, dedicated towards low end consumer segment. The company aims to cater to entire value chain of customers by providing both low and high priced profiles. Profine India has expanded its manufacturing capacity. Increased acceptance of UPVC doors and windows coupled with developments in the construction sector has augmented the market revenues of India UPVC Doors and windows market during FY’2013-FY’2018. The report is useful for polymer additive manufacturers, traders, importers and other stakeholders to align their market centric strategies according to ongoing and expected trends in the future. The PVC pipe and fittings industry has performed well as broad economic improvements and revitalized construction activity have driven up demand for industry products from a variety of downstream markets. Despite the current global economic slowdown due to fall in oil & gas prices, Saudi Arabia has emerged as one of the most attractive investment destination in the Middle East’s PVC pipes and fittings industries.